Prior to today I had been coding my mods in NotePad++, occasionally calling the java compiler from the command line when I needed more detailed error messages. Not exactly ideal. 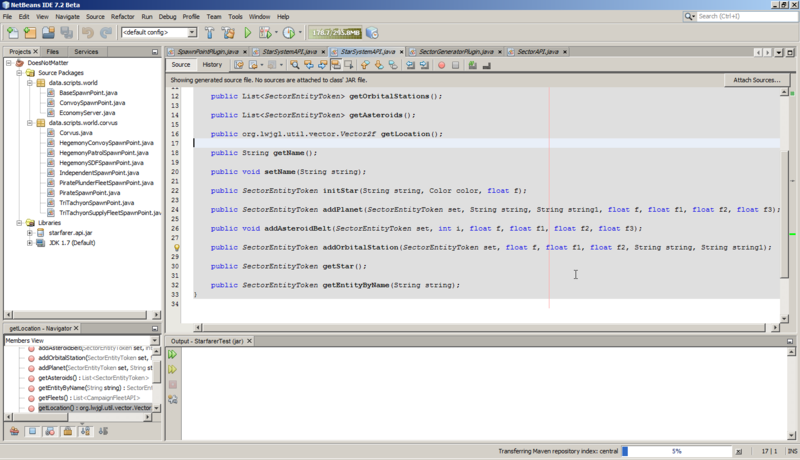 So I decided to pick up a real Java IDE, and ended up choosing NetBeans. It's been such a massive improvement that I figured I would help pave the way for any others who want to try it out. 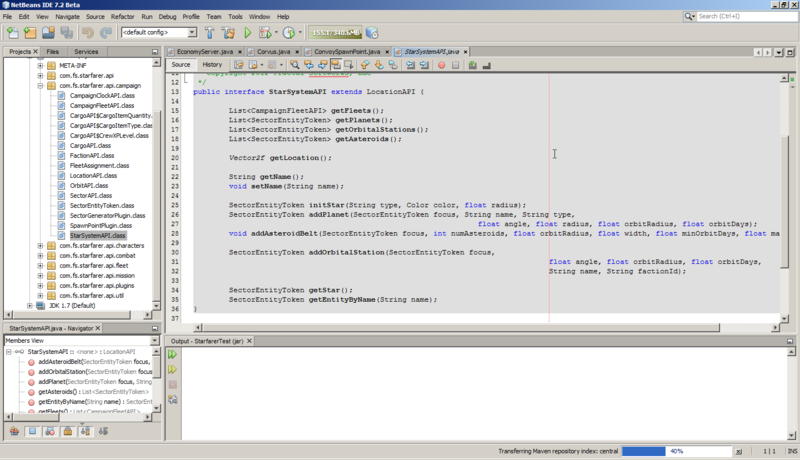 Here's a tutorial to get an existing mod working in NetBeans. If I explained something poorly, click the spoiler tag underneath that paragraph for pictures. "This looks like a really difficult tutorial. I mean, it's like four pages long. Is this really worth it?" It's not as hard as it looks, I'm just terrible at writing tutorials . Plus, it has lots of pretty pictures to look at . As for why you would want to work in a real IDE, there are a few benefits: most importantly, you will get instant feedback on any bugs you make. If you've been editing the java files in Notepad++ or something so far, you're probably intimately familiar with the following: trying to launch Starfarer, having it crash, then reading the end of a logfile to get a uselessly cryptic error message about what went wrong. 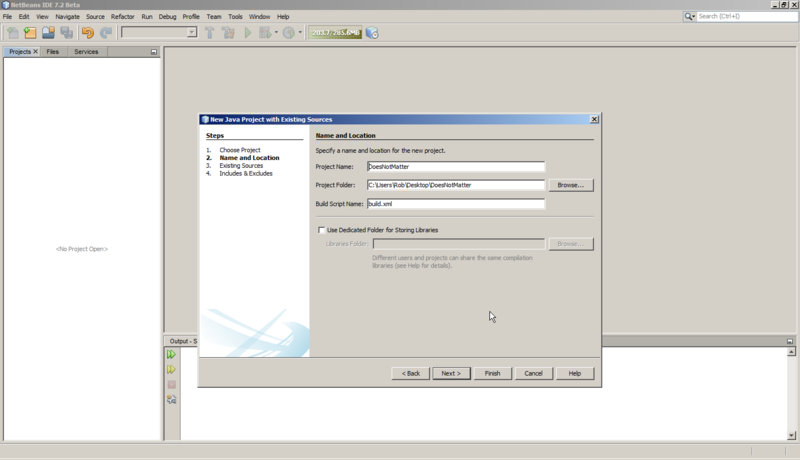 With NetBeans you get real error messages, ones you can Google for help with, and you get them as you type. Bugs become much easier to squash. It also has a host of other features that I won't bore you with. Let's begin. First up, you will need the Java Development Kit if you don't already have it (if you have to ask, you probably don't have it). That can be downloaded here (it's the download called JDK, if that wasn't obvious). Java 6 or 7, doesn't really matter. 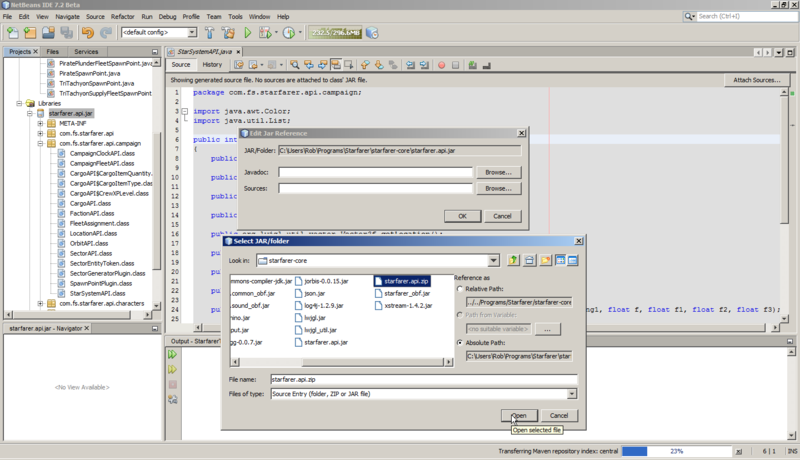 Compatability isn't an issue since you won't be using what you compile with NetBeans (Starfarer compiles the mods itself when it launches); NetBeans just makes working with the source files a lot easier. Next, you'll need NetBeans itself. 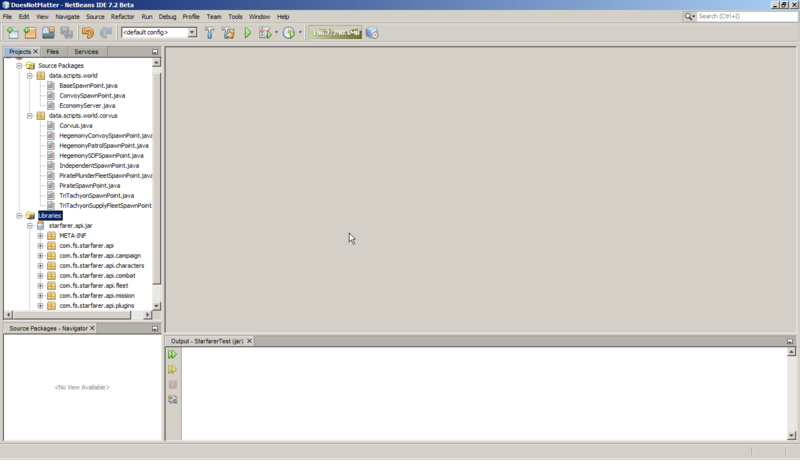 NetBeans can be downloaded from netbeans.org. It's up to you if you grab the beta version or not; I've tried both and either should work just fine. You only need the Java SE version for making Starfarer mods. Go to File - New Project. 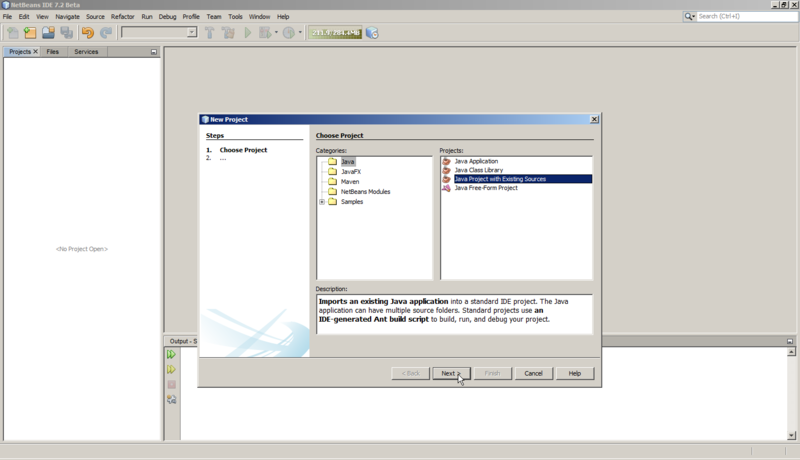 Make sure the category is set to Java and select "Java Project with Existing Sources" in the Projects box. Hit Next. Name your project anything you like, and put it anywhere except in your mod folder. 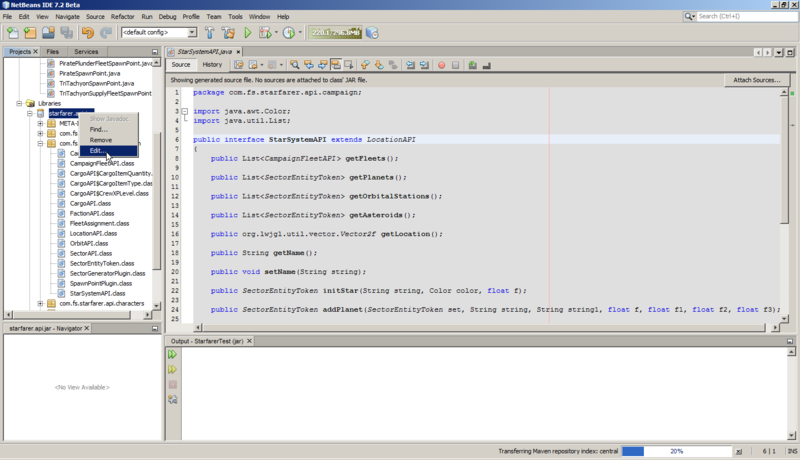 We're not interested in the project files NetBeans generates. You'll now see two empty boxes. We're interested in the top one, Source Package Folders. 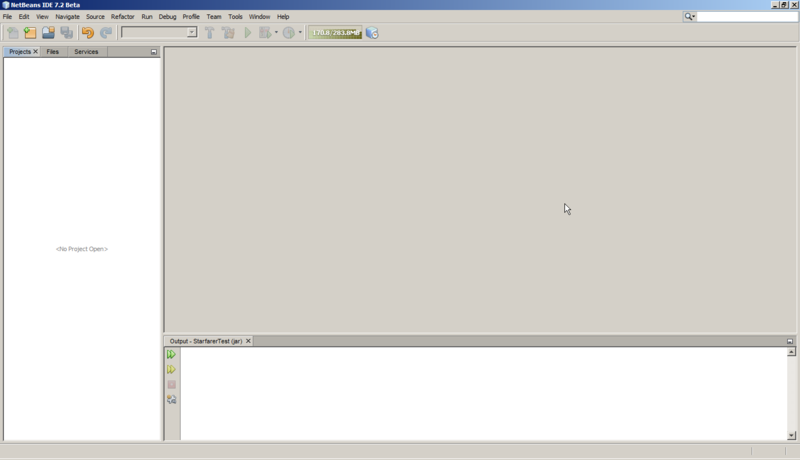 Hit "Add Folder" to the right of this box. Browse to the mods directory and select your mod folder (ignore the image below showing the data folder, it's wrong). Hit OK, then Next. Now we come to the Includes & Excludes menu. Chances are that your mod isn't pure code, so we'll have do to a bit of work here. 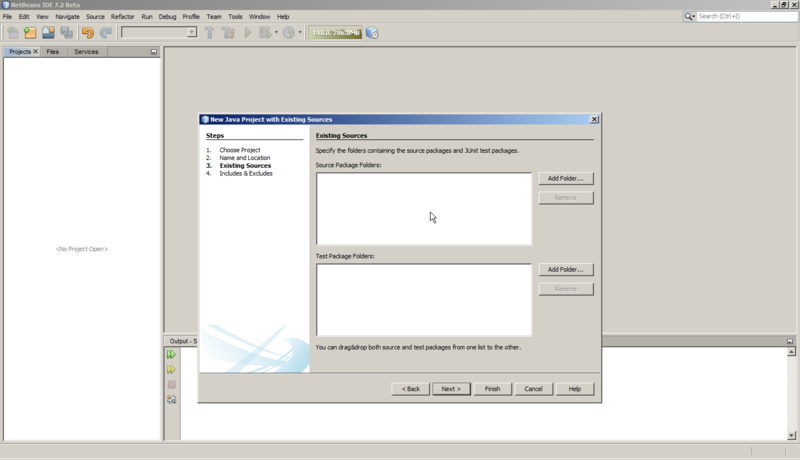 Change the text in the Includes box from "**" to "**/*.java". If you did this right, only your .java files are in the Included Files box now, with everything else under Excluded Files. Hit Finish. (Ignore the background in this one. I forgot to take a screenshot, so had to go back later. 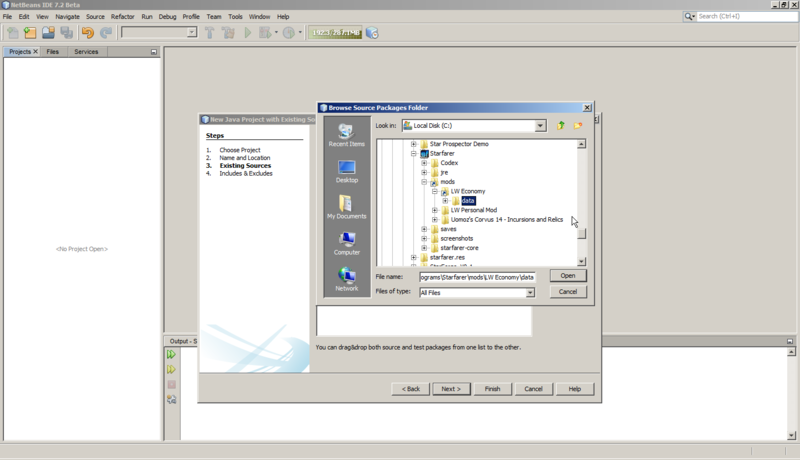 You should now be able to see your project's folder structure under the Projects tab on the left of the main IDE screen. But what's with all the red exclamation point signs? Well, you're still missing something very important. Your code is referencing all these Starfarer APIs, but NetBeans has no idea what you are talking about. To fix this, we need to add the Starfarer API to the Project Libraries. 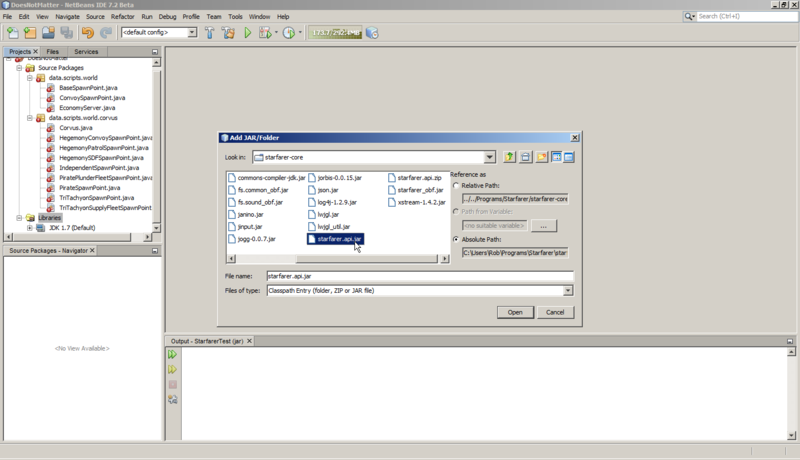 Right click on Libraries in the Project tab, and select "Add Jar/Folder". Navigate to the Starfarer install directory, and enter the folder starfarer-core. Find starfarer.api.jar and select it. You might also want to add lwjgl_util.jar, as that is where the Vector2f class is defined. Note that at this point you're probably still going to have a bunch of compile errors due to missing dependencies. Remember, Starfarer mods work by adding your mod on top of what's in starfarer-core, and NetBeans doesn't know about those files. The laziest easiest way to fix this is to just look at the compile errors, find out what files are missing, and copy them over from the Starfarer/starfarer-core/data directory (for most current mods, BaseSpawnPoint will be the big one). After you're done, go to Source - Scan for External Changes. 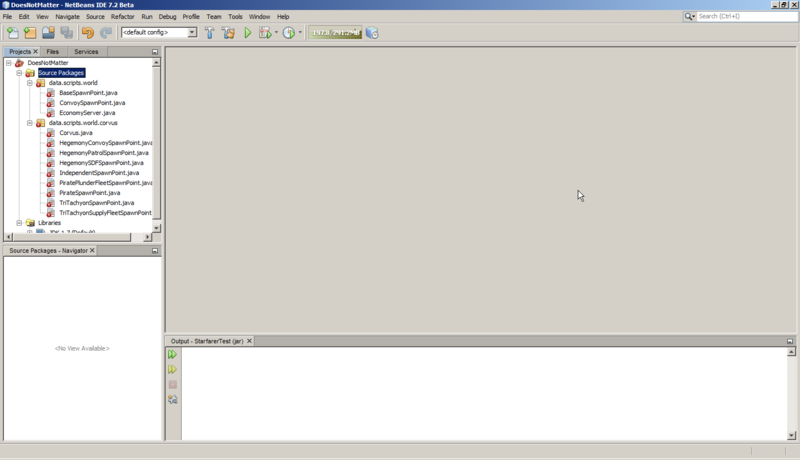 That should allow NetBeans to notice the files you just added. Don't worry about cluttering up your mod, you should only need a few files; even if you did somehow require every core file for compatability, it would add less than 100 kilobytes to your mod size. 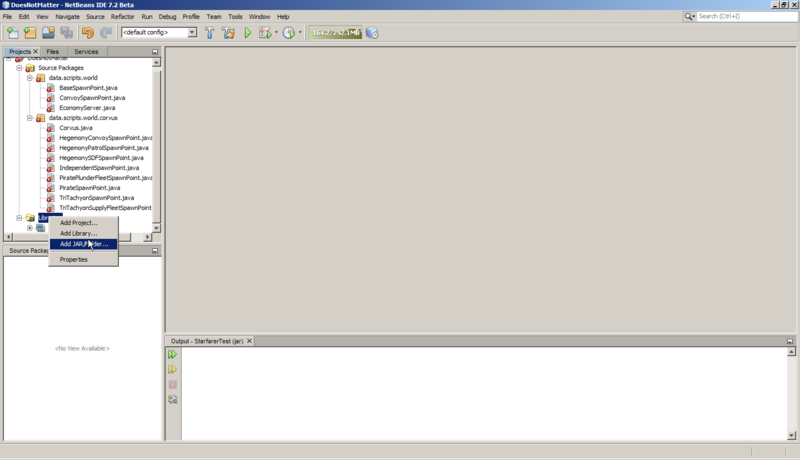 I'm sure there's a better way of doing this, does anyone who uses NetBeans know of one? I'm aware that you can add starfarer-core to your project source, but then you run the risk of editing core files. Most of the compile error warnings should have vanished now (you might still have to do a bit of cleanup), and as an added bonus you can now browse the API at your leisure in the Libraries tree. You're looking at a generated source file. Not very intuitive, is it? Don't worry, we can fix this. Right click on starfarer.api.jar in your Projects tab, and click Edit. Hit the Browse button next to Sources and head back to starfarer-core. This time, select starfarer.api.zip. You're pretty much ready to go at this point. Happy coding! Ahh.....thanks! Some of the errors I get aren't noted very well in the .log, will this help me in that? I mean, like tell me the actual source file? Yep. And it shows more than one error at a time, too, unlike starfarer.log. Comprehensive tutorial of a good thing. 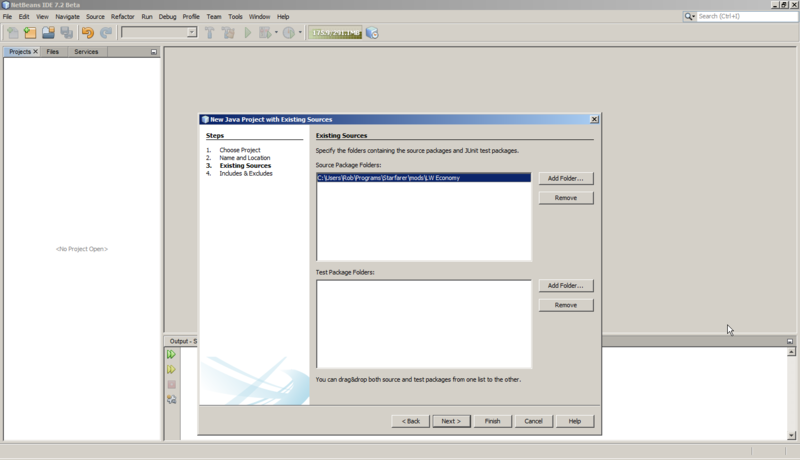 Describes in detail of what to do and how to install. Why did you say that you didn't know how to write a tutorial? Why did tou say that you didn't know how to write a tutorial? Back when I worked on a MUD, whenever I tried to explain something technical to a non-coder they would end up more confused than before. It became kind of a running joke that I couldn't get others to understand me. Hmm, I guess I'm getting better at it. I'm Sorry for acting stupid here, but what's a MUD? Text-based MMO, precursors to modern MMOs. In fact, the first MMOs were called graphical MUDS before they decided on a better name. Lazy, im very greatful you joined the forums, you have, so far, really helped with tutorials, care to help my noobs guide to modding out? it's like four pages long. Is this really worth it? Haha yeah MUDs must seem like some ancient form of entertainment to a 14 year old. Thanks bunches for this tutorial. I only know basic programming structure and theory (veryyy basic) so I'm basically stuck with grabbing a completed code and modifying it as best I can for my custom stuff. This should help a lot with learning how to make my own missions (and eventually faction). Made my own mission after getting this all set up, thanks a lot! Now to make more ships and weapons so I have something actually worth modding in. "If it aint broke, don't fix it." mumuorpeguh is not a better name than g-mud. Making the mission isn't the hard part. Once you get used to it, you can whip out mission in mere minutes. It's campaign where this really makes it easier. If you've ever modded campaign .java files, you'll know what I mean. Yeah, once I figured out the mission coding, it was pretty simple. It's just that I haven't programmed anything since about junior year of highschool (which was about 6 years ago now) and that was just SUPER BASIC VB. Luckily the code is quite intuitively layed out upon glancing at it. And looking at the comments some modders have put in helped a bunch. It seems most of the work making my own faction will be in the spriting and balancing of ships and weapons.